Over the past couple years, a good social media presence has become one of the most important self-promotional tools for Sundance filmmakers. 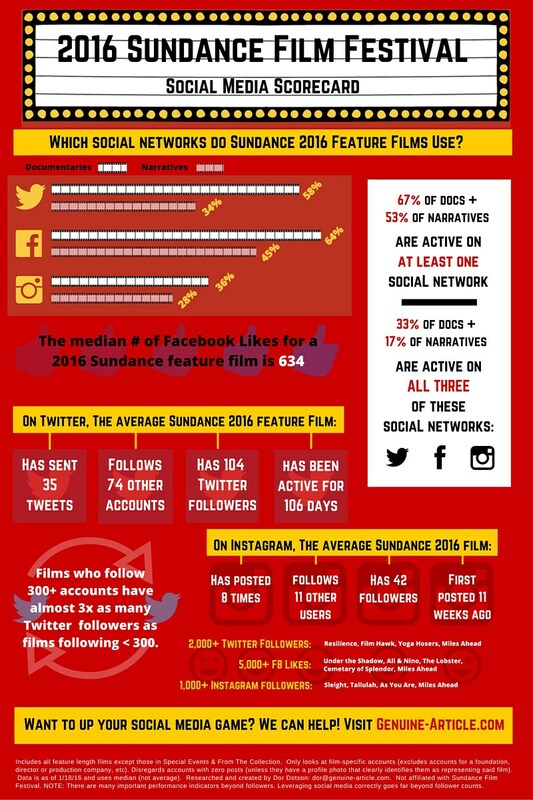 Not only are sites like Twitter and Facebook good marketing tools for Sundance features, but they can also help prospective distributors gauge how large a film’s fanbase is growing or how strongly certain films are performing. To help put this year’s Sundance Film Festival and social media into a clearer picture, the team over at Genuine Article have constructed a handy scorecard to help us all keep track of the festival’s presence. For the infographc, Genuine Article chose to look at social media pages dedicated to the accounts for the films themselves, not for the filmmaker’s personal social media platforms. The results paint an insightful picture into the relationship between social media and this year’s festival. For more analysis, head over to Genuine Article. Check out the inforgraphic below.